In 1993 a group of young landscape architects from Berlin presented a blueprint for the design of the European Holocaust Memorial. This memorial should resemble a gaping wound in the landscape in order to underline the special character of the site. They wanted to create a place of remembrance without any monumental sculptures or playful design. Unfortunately the original blueprint could not be realized because of a strong opposition and insufficient financial support. Nevertheless, after countless hours of volunteer work, the citizens´ association succeeded in creating an ensemble in the spirit of the above mentioned original blueprint. This ensemble in a very special way ends with the strict separation of historic reappraising and remembrance work that is promoted by professor Martin Broszat, a German post war historian from the Institute for Contemporary History, and Saul Friedländer, a Jewish Holocaust researcher. According to these two academics, non-Jewish researchers should only concentrate on historic reappraising and leave the remembrance work to the Jewish people. We think that it is our task to harmonize symbols and reality and to give expression to the symbols hidden in nature. Through the historicity and the memories linked to it, this has been made possible at the European Holocaust memorial. Direct visual perception of all elements has also been realized. Archaeological traces accompany the visitor throughout the whole memorial site. The visitor can penetrate the essence of the visible – but they should not go any further. Sensitive people can feel mysterious energies sent out by this place, and they might also feel the accusations of this historic place as well as the personal memories linked to it. Nobody should cherish a non-committal imagination or remain only in the historicity that is dead and does not allow thinking in memories but rather even prohibits it. This site revives the historic events, makes them comprehensible and walkable. At the European Holocaust Memorial memories and experiences are vivid and visible, whereas objective historic papers alone are lifeless. They will make the memories fade away and in the course of time will make them vanish completely. This site in every respect bears witness to what the Holocaust was and what it means for the future. 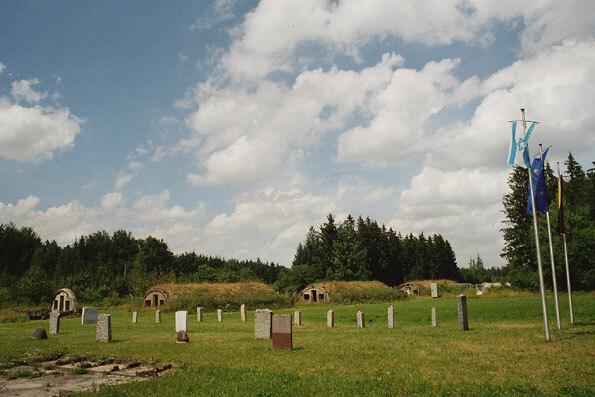 The entrance to the memorial as a symbol of suffering and hope, and the actual concentration camp memorial, the former concentration camp commando unit Kaufering VII.